Many of us respond to the pressures of life by turning inward and ignoring problems, sometimes resulting in anxiety or depression. Others react by working harder at the office, at school, or at home, hoping that this will make ourselves and the people we love happier. But what if being yourself is enough? 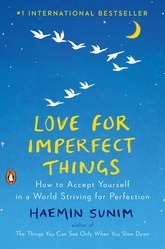 Zen Buddhist monk Haemin Sunim turns his trademark wisdom to the art of self-care, arguing that only by accepting yourself—and the flaws that make you who you are—can you have fulfilling relationships with your partner, family, and friends. With more than thirty-five full-color illustrations, Love for Imperfect Things will appeal to both your eyes and your heart, and help you learn to love yourself, your life, and everyone in it.